Design Unlimited, the leading interior design and exterior styling studio for production and super yachts, is celebrating the latest models to be launched under its partnership with the world’s leading manufacturer of production sailing boats – Bavaria Yachtbau GmbH. Shown for the first time at Cannes, the models are the new, high-end Vision 42 and the family-orientated Cruiser 33, and continue Bavaria’s roll-out of exciting new designs with exceptionally roomy interiors. “Designing for boats in this size bracket is very demanding,” said Mark Tucker of Design Unlimited. “The expectations of owners when it comes to space, amenities, light and quality get greater as every year goes by. The challenge this presents is enormous and it is very satisfying when all the components come together to create boats that we know will give great pleasure to their future owners. 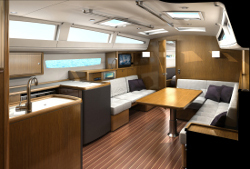 Externally, Design Unlimited has ensured that both boats have spacious cockpits that are as much part of the living space as the interiors. This makes the boats ideal for extended cruising. The Vision 42 features additional innovative details such as the asymmetrical cockpit layout with an offset hatch. This creates a single, safe gangway and contributes significantly to the impressive amount of space in the cockpit. Design Unlimited’s partnership with Bavaria began with the Vision 46 launched at the start of 2012. That yacht received a highly positive reception and it is hoped that these two new models, with their naval architecture again by Farr Yacht Design, will receive similar recognition.